We have arrived at Makemo Atoll in the Tuamotu Archipelago. This part of French Polynesia is so old that all that's left of the original volcanic islands is the ring of limestone islets and coral reefs that once bordered them. Makemo Atoll is 30 miles long and 10 miles wide. There are only two passes in and we had to time our entry with the tides so that the tidal current was not too strong. It was around 2.5 knots against us. We've been here a day and apart from resting up, we've done some snorkeling. The water is exceptionally clear and yet again we are faced with numerous new species of fish. 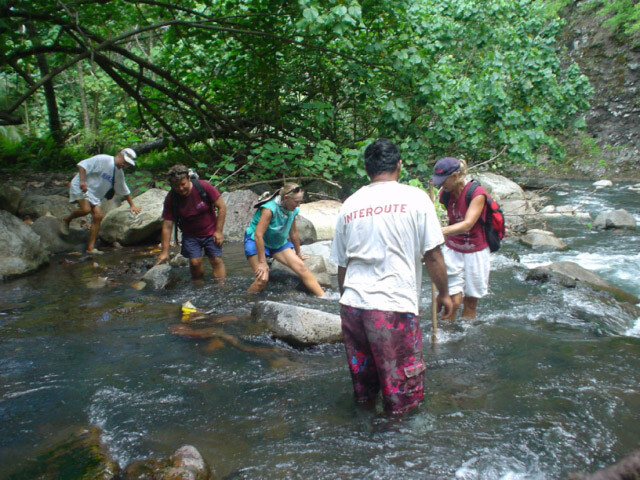 We recognized only about 30% of the fish from the Marquesas! The small building in the picture is a pearl farm. 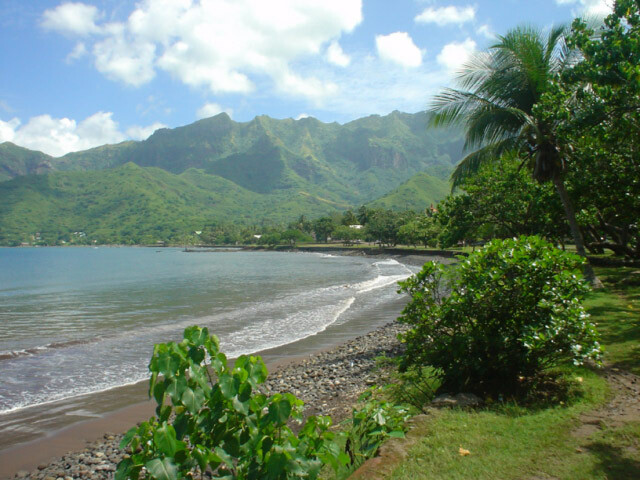 We've spent 3 weeks in the Marquesas. We visited each of the three main islands of the northern group. We missed the southern group altogether, for various reasons -- we can't visit every island in the South Pacific! After 5 days diving at UA HUKA we moved on to the island of NUKA HIVA where we cleared-in with the gendarmerie at the main town in TAIOHAE Bay. Ginger had to deposit a $1300 Repatriation Bond; as an EU Citizen, I did not. It's a nice little town with two grocery stores, three restaurants and a gas station. So in a few days we were able to re-supply with produce and fuel, and eat out. These chores done, we moved to Daniel's Bay for a few days. Here, we hiked up the valley with the crews of two other boats and visited a spectacular high waterfall where we swam in the pool beneath it. We also dived near Daniels Bay, but visibility was poor. After another produce stop in TAIOHAE we visited Controller Bay for a couple of days and made two dives there. 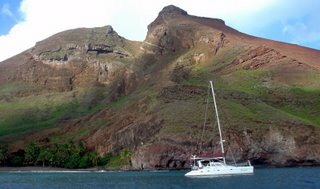 Finally, we crossed to the island of UA POU and stayed several days in VAEIHU Bay for three more dives. The 11 dives we did in the Marquesas were generally very good with plenty of fish of many new species, many unique to these islands, but what was remarkable was the prevalence of Manta Rays. We saw Mantas during or close by 9 of our 11 dives. We saw more Mantas than sharks! That is very unusual. We have now left UA POU and are underway south to the TUOMOTU Archipeligo, a 480 mile trip of 3-4 days. 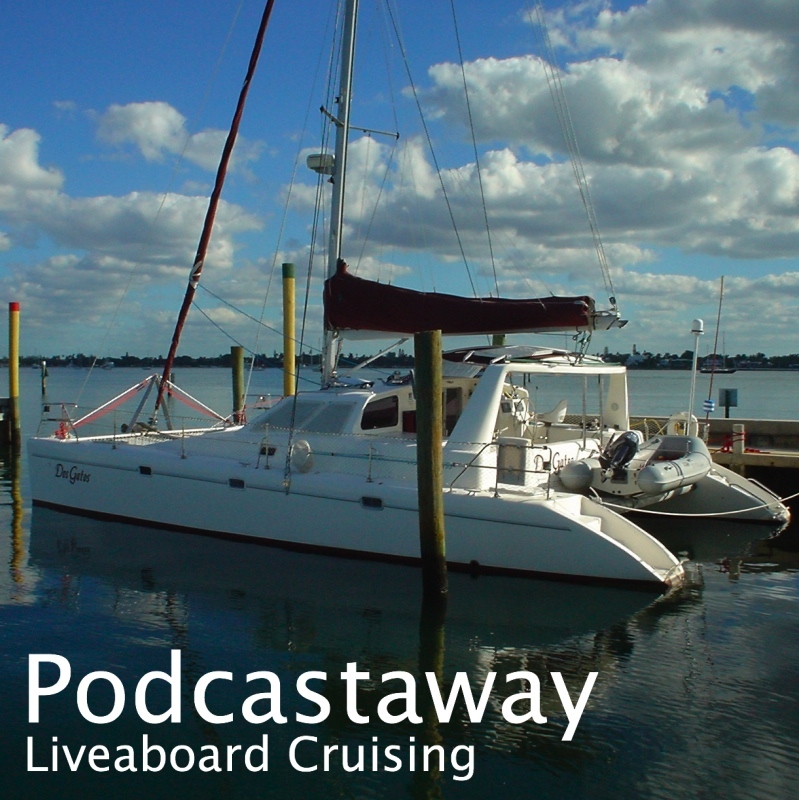 I have just posted podcast #16 recorded during our passage from Galapagos to the Marquesas. It may be downloaded, or subscribed to, from my PodCastaway page. We made three dives at UA-HUKA; our first stop in the Marquesas. Once again we were blown away by the number of beautiful fish that we had never seen before -- several we identified as unique to the Marquesas. In the Caribbean we would search during each dive for something new. So far in the Pacific -- Galapagos and now here -- we search for something familiar. 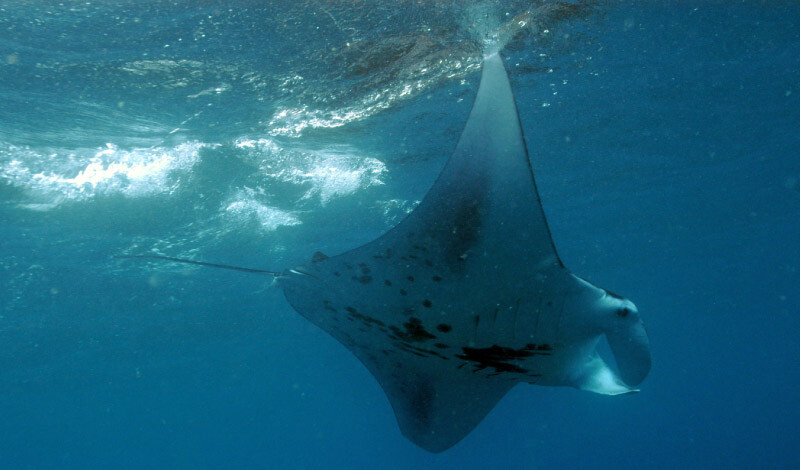 Our cruising guide remarked that the bay in which we anchored was frequented by Manta Rays. Sure enough, every day we came across a group of them sweeping around just under the surface feeding on - who knows what. We snorkeled with them and then made shallow dives in order better to photograph them. They were unafraid -- of course they are much bigger than us, maybe 8-10 feet across -- and they kept retracing their path. Best Manta viewing ever! This morning we dropped anchor in Haavei Bay at the island of UA-HUKA completing our 3000 mile passage in exactly 21 days. Apart from a few days of uncomfortable lumpy seas the passage went very well -- good 15-18 knot winds most days and no significant problems with the boat. We saw two distant fishing boats, a few terns, but nothing else! We've stopped for a day or two at UA-HUKA prior to going to NUKA HIVA to check in -- another 30 miles. Right now we're looking forward to some uninterrupted sleep, and later to getting to a civilized location with grocery stores and maybe a restaurant. Also, we're looking forward to getting into the water to do some diving.